Rugby league’s in-fighting continued yesterday with St Helens chairman Eamonn McManus accusing Leeds chief executive Gary Hetherington of distorting the truth over Super League’s planned re-organisation. McManus was among the Super League chiefs who seized control of their own destiny at an extraordinary general meeting last November by successfully overthrowing former Rugby Football League chief executive Nigel Wood from the board with a 9-3 vote. 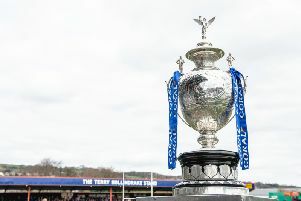 With a majority now of 11-1, their next step was to appoint their own chief executive and they took the opportunity at the unveiling of Robert Elstone on Tuesday to announce plans for another major restructure of the game with the scrapping of the Super 8s. That prompted Hetherington to describe it as “an absurd power-grab by a small group of men who think that they own the game”. McManus has responded by insisting the new board has acted democratically and says Rhinos chief Hetherington’s comments were “inaccurate in content” and “destructive in intention”. “The decision to appoint a dedicated and focused CEO of the highest professional calibre was made enthusiastically and overwhelmingly by a fully constituted board of directors of Super League who wish only to improve the quality, profile and commercial performance of their elite competition,” McManus said. “No director of Super League acts as though he owns the game. However, their clubs do actually own Super League and in equal shareholding proportions. “They intend to run Super League democratically and professionally, as is our duty. I have never known Super League clubs to be so unified and to have such a strength of purpose as they do presently. “Gary’s comments on the Super League competition structure vote were also as inaccurate in content as they were destructive in intention. “The board of Super League, by a majority of 11 to 1, voted to end to the Super 8s structure and to replace it with a more orthodox and readily understood form of promotion and relegation.